1. In a pot, boil water for the pasta. 2. In a skillet with a generous glug of oil, sauté onions, garlic and celery, letting it sweat together for a few minutes until aromatic. 3. Add 2 chopped fresh tomatoes to the skillet and cook it down, adding wine or water as necessary. Add basil, a few drops of Tabasco and teensy little bit of sucanat. Pour into a bowl and set aside. 4. Place pasta in the boiling water with a generous sprinkle of salt. 5. To the same, unwashed skillet add another glug of extra virgin olive oil and warm it with a sprinkle of chili flakes. 6. When hot, quickly add the prawns in a single layer and cook it until pink with a sprinkle of salt. 7. Finish the prawns with a squeeze of fresh lemon juice (without the seeds, of course) and set aside. 8. Drain pasta when al dente and return to the pot. 9. 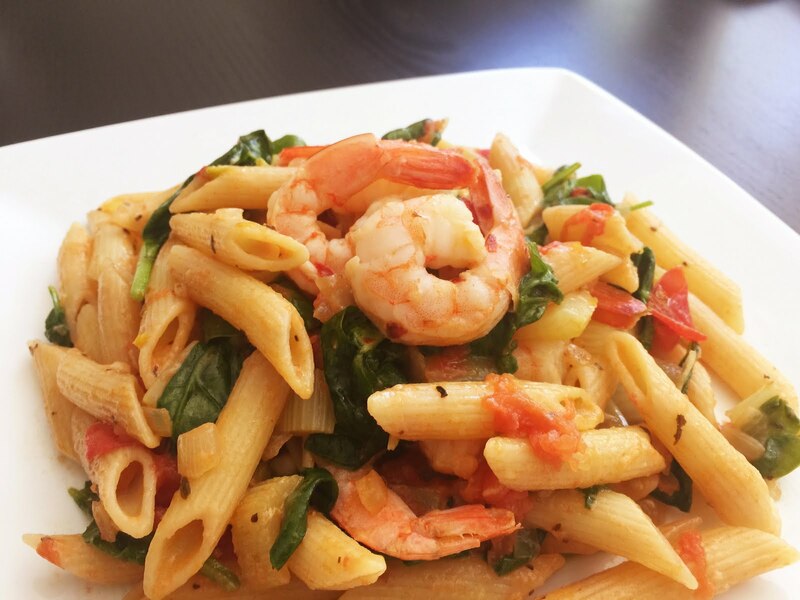 Add the tomato sauce to the pasta pot with your prawns and let it cook for a minute. Finish with a handful (or three) of spinach and a dusting of Parmigiano Reggiano. And viola! Lunch under 10'!